49er, 49erFX, Nacra 17, and Male/Female Foiling Kitesurf will compete for the joint 2018 European Championship in La Rochelle, France. These 5 progressive sailing events will wow the nautical French city just one month before the first Olympic qualifiers. Together these events represent some of the most dynamic athletes in sailing. These sailors push modern craft to the highest levels. The 49er, 49erFX, and mixed Nacra 17 are all Olympic class boats currently, and the foiling kitesurfer aims to gain Olympic status for 2024. All five events will also be included in the Aarhus 2018 Sailing World Championship which will also serve as the first qualifier for the 2020 Olympics. Racing for the combined Europeans is scheduled from July 8-13, 2018, with pre-regatta formalities beginning on July 5th. There will be three days of qualification followed by three days of finals for the Olympic classes, with a format yet to be determined for the kites. The final three days will be live broadcasted for free to the public as has been the tradition for the past number of years. This progressive sailing festival is meant to be a chance to bring together a like minded but diverse group of modern sailors. La Rochelle is a traditional nautical area, with a long history in modern and traditional sailing. The regatta will be based from the Societe des Regates Rochelaises (SRR), a host organization that has performed many large-scale regattas in the recent past including the autumn French Olympic week under the old grade 1 / grade 2 system when World Sailing was ISAF. “We are delighted to be working with the folks in La Rochelle to bring this large and complex championship. The European Championships is the second most important championship annually for Olympic classes and we are excited to be racing in such a fine venue. It will also be nice to race alongside our friends from the kitesurfing community, who share a passion for modern sailing technology and a collaborate culture,”said president of the 49er and Nacra 17 classes, Marcus Spillane. ”Being included in this world class event means a lot to us and shows the continued integration of kiteracing into multi-class sailing events. Competing in France, the “motherland” of kitefoil-racing together with the other high-performance Olympic Classes is another step to showcase progressive equipment and competition formats. Be prepared for a true spectacle” says Markus Schwendtner, CEO of the International Kiteboarding Association. 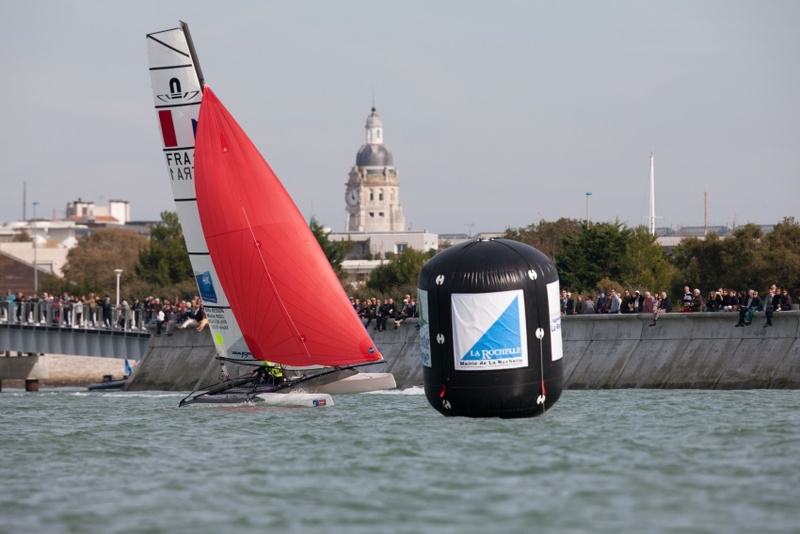 “We're really thrilled to host such an exciting regatta in La Rochelle. Our ability to race in front of the public at this time of the year will make it a spectacular event. And we can't wait to see the first kite race ever in La Rochelle! This event will be the climax of the 2018 season”,Said Alain Mevellec, president of Société des Régates Rochelaises (SRR). For the 49er class this is the 22ndEuropean Championship of the class with Dylan Fletcher and Stuart Bithell winning both the Europeans and Worlds last year in their first major championship titles in the 49er. They will be odds on favorites to repeat. For the 49erFX this is the 6thEuropean Championship. Last years winners were Tina Lutz and Susan Beucke of Germany, who won on a blustery final day with a win or swim attitude that was more than the competition could handle. The 49erFX class will be a tough title to predict ahead of time since it is expected that every champion from all previous worlds and Europeans is likely to attend. For the Nacra 17 this is also the 6thever European Championship with Ruggero Tita and Caterina Banti from Italy wining in 2017. This will be the first major championship of the foiling class with all teams having been fully trained up on the boats. The 2018 events were conducted with teams having the boats for only a few months, so with a full year of practice under their belts this championship will be a great test for top teams ahead of Aarhus Olympic qualifying. It will be the 8thEuropean Championship for the Formula Kite Class, which has made the step to “fully foiling” in 2014. The class enjoys a healthy cross-over not only from traditional sailing classes like Optimist, where most of the current top sailors earned their first victories, but also from high performance sailing and match racing. Defending European Champions are Nico Parlier and Alexia Fancelli, both from France, who hope to defend their titles on home turf.